Inspired by Summersing Music and Arts Empowerment Camp in Montana, Wo-Ma-Mu retreats are held each spring and fall in northern California. We are a community of big-hearted women who love to sing, laugh, learn and play. We support risk-taking and cooperative music-making for everyone from professionals to complete beginners. 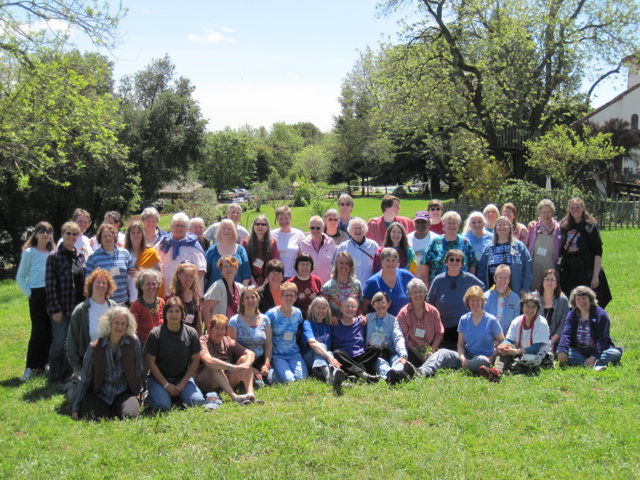 Over four hundred women have been to our retreats since our first gathering in 1991 under the directorship of Singer-Songwriter Judy Fjell and the WoMaMu nonprofit board. Fall 2016 marked our FIFTIETH camp and our 25th year! We now begin the second half our our Planet WoMaMu rotation around the sun. In 2017 Judy Fjell retired as Camp Director and handed the baton to our very able longtime camper and musical director Marianne Barlow. Congratulations, Marianne, and thank you, Judy, for your years of leadership! Staff members over the years have included Harmony Grisman, Piper Heisig, Jamie Anderson, Pamela Stoneham, Debbie Fier, Nancy Schimmel, Deborah Liv Johnson, Cynthia Llano, Frannie Leopold, Ellen Silva, Laura Silverstein, Carolyn Terry, Madge Strong, Bonnie Lockhart, Ann Maglinte, Josie Mendelsohn, Holly Near, Alix Dobkin, Mary Watkins, Stormi Oshun, Tami Pallingston, Linda Joplin, Faith Petric, Crystal Reeves, Rowan Storm, Betsy Rose, Mary Buckley, Haute Flash Quartet, Rebecca Riots, Madge Strong, Marianne Barlow and many others. In addition to the regular workshops, WoMaMu offers campers a wonderful opportunity to jam together, participate in carefree singalongs, perform at open no-mics, learn some new dance steps, take bird and wildflower walks, or sit quietly in the woods or an easy chair at The Bishop's Ranch. Our camp is alcohol-free, drug-free, scent-free, and wheelchair accessible. The excellent kitchen at the Bishop's Ranch makes dining a wonderful experience for all dietary needs. The quality of music, creativity, and conversation at WoMaMu is unique and unsurpassed. Women of ALL musical abilities are truly welcome. Flyer and Registration form available now. Click here. What does a WoMaMu weekend look like? Click here to see the Photo Gallery from Fall 2005 WoMaMu!